Containment Protocols: All instances of RPC-220 are to be stored within an activated Titanium Hydride ingot in a high-value item container in Sector H of Site-002, along with a separate container holding RPC-220-1 inside a cushioned briefcase. RPC-220's container must be inspected on a bi-weekly basis for any signs of a leak to avoid a containment breach and possible contamination. During testing, admitted personnel must wear the appropriate RPC-220 Handling Gear with the activated Titanium Hydride ingot to be discharged to extract RPC-220. The decomposed ingot may be recycled into a reversible containment vessel for future use. The chamber holding both RPC-220 and RPC-220-1 must be evacuated of all biological tissues during testing. Description: RPC-220 is a 20.63kg (as of July 2018) mass of Tritium Hydrogen isotope with a Muon replacing each one of the Tritium atom's electrons. 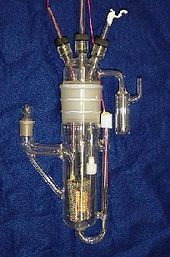 RPC-220-1 is a Muon-catalyzed fusion apparatus used to test and/or use RPC-220 as an energy source. As there are no known naturally occurring Muon-Tritium sources, instances of RPC-220 suggests of an artificial production. Such procedure requires a power of ██GW and only has 1% chance of creating one atom of RPC-220. Artificially creating the mass of RPC-220 is—with all intents and purposes—impossible. However, the Muon that replaces one of the electrons in RPC-220 atoms does not decay into e−, νe or νμ within 2.1969811(22)×10−6 s. Instead, the Muons seem to permanently attach into the Tritium isotope. Nonetheless, the Tritium isotope will decay half its mass into Helium-3 and Muon in 1█.██ years. At this rate, all instances of RPC-220 will decay by ██/██/20██ or sooner, depending on the usage of RPC-220. Research on using instances of RPC-220 as a Muon-catalyzed fusion (Cold Fusion) as an energy source has been approved by Global Director 04 in ██/██/199█. The result was a fusion reaction occurring at approximately 3██ Kelvin with a power output of ██ GW. The Helium-3 byproduct of the reaction shows no extranormal traits. Instances of RPC-220 were discovered within a Palladium Hydride ingot inside an abandoned Soviet nuclear weapons storage bunker near █████ in the Siberian Permafrost. Along with RPC-220, the plans of harnessing RPC-220 as an energy source along with the Muon-catalyzed fusion apparatus (later designated as RPC-220-1) were also seized into Authority custody. On ██/██/█████, The Board invited engineering representatives from Nucorp Industries to take part in the research of RPC-220 instances. The goal is to utilize the information gathered during the observation into developing a fully functional ultra-high temperature fusion reactor. It is estimated that Nucorp's new fusion reactor will be ready for production in ██/██/████.